Long before Rosé All Day was a hashtag, innovative Champagne producer Madame Clicquot made the first commercial pink bubbly. Abandoning the practice of adding a mixture of elderberries to impart a pink hue to the sparkling wines from Champagne, Barbe-Nicole Ponsardin Clicquot developed a blend of white and red wine to produce the base wine for a new style of Champagne. 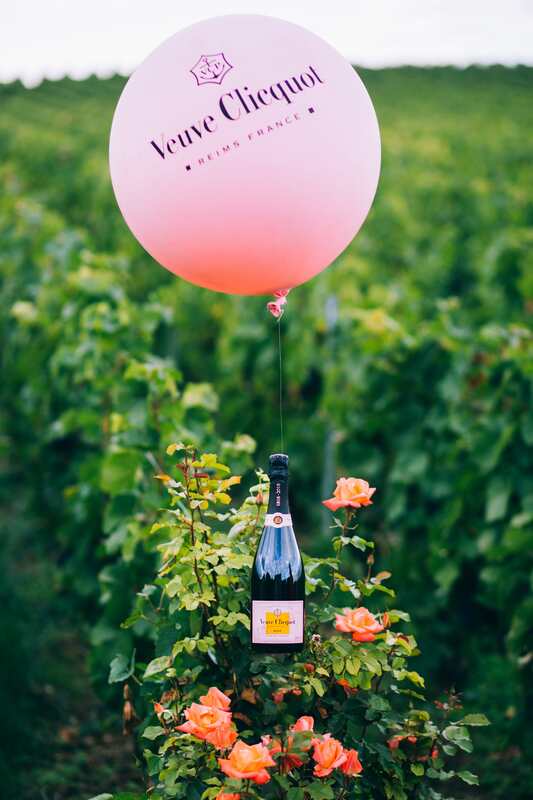 Not one to miss a marketing opportunity, having famously coloured the Eiffel Tower pink to launch its non-vintage rosé in 2006, Veuve Clicquot is hosting a series of events around the world to honour its legacy. In March, they kicked off their promotional efforts with a tasting for international media at its head quarters in Reims. 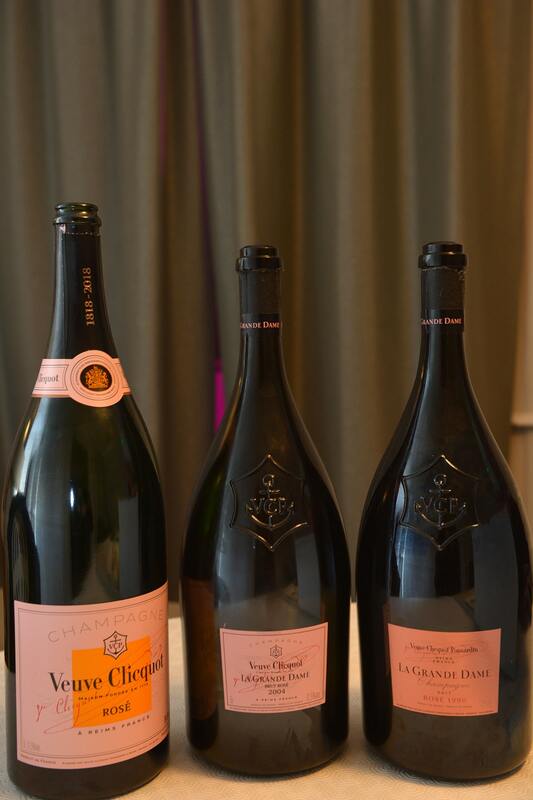 The daylong event served to introduce new releases and outline the importance of their red wine production for the increasing quality of their rosé champagnes. “We’re celebrating 200 hundred years of blending red wines and white wines to make a rosé, celebrating the innovation of Madame Clicquot in 1818,” explained Dominique Demarville, cellar master of Veuve Clicquot. These are wines with more fruit flavours, more intensity and more structure than the white Veuve Clicquot releases. In addition to its widely available non-vintage Rosé Champagne, Veuve Clicquot also produces a Vintage Rosé as well as La Grande Dame Rosé, the top-of-the-line bubbly that pays tribute to Madame Clicquot. A newer cuvée, Rich Rosé, is blended to be a sweeter style to serve over ice in a wider-bowled wine glass with fresh fruit or used for Champagne cocktails. There is also a special reserve label, Cave Privée, which sees small lots of magnum-sized bottles (twice the size of a conventional bottle) of Vintage Rosé aged in Veuve Clicquot’s cellars released for collectors and connoisseurs. Recent releases include the 1989 and 1990 vintages. Demarville noted Madame Clicquot’s personal enjoyment of the red wines made from a Grand Cru parcel of vines in the nearby village of Bouzy helped to spur her invention. Red wines made from the Pinot Noir grapes grown in the Clos Colin vineyard have long been prized for their quality and character. Whether processed as a white wine or rich red wine, the Pinot Noir grape helps define the style of all of the wines produced at Veuve Clicquot. Chardonnay and Pinot Meunier play their role, he said. But Pinot Noir? It’s the DNA of the house, he said. Widowed at the age of 27, Madame Clicquot took over the business and set about revolutionizing how Champagne was made and marketed. While the early years of the business were tumultuous, she preserved and is credited with developing the process of riddling in 1816 to remove yeast particles that made all Champagnes cloudy. With a few minor tweaks, the efficient process of disgorgement for the final corking of Champagne bottles is still employed today. Prior to selling bottles with labels, she had Veuve Clicquot corks branded with an anchor and sealed bottles with a green wax in order to prevent fraud. In February 1878 the company registered its distinguishing yellow label as a trademark and to protect its reputation in international markets. Champagne Ruinart’s records show it was the first to sell rosé Champagne commercially in 1764, 60 bottles referred to in sales ledgers as Oeil de Perdrix, or “eye of the partridge,” a term still used by some producers today for their rosés. 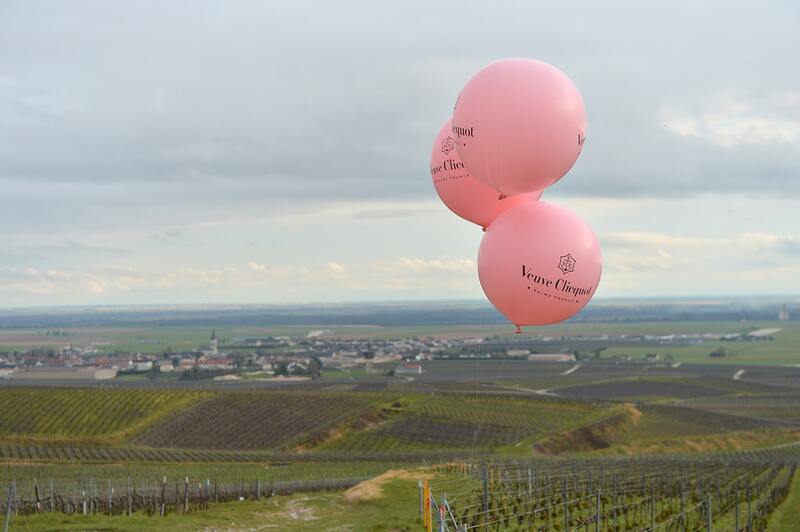 Veuve Clicquot makes its claim as the first exporter of rosé Champagne with a sale to Switzerland in 1775. Despite these successes, rosé Champagne was seen as inferior prior to Madame Clicquot’s improvement. It was demeaned as being “stained.” White Champagne was the choice of royalty and the upper classes as it showed a hallmark of quality winemaking. The majority of grapes planted in Champagne at the time were black — still the case today, with Pinot Noir and Muenier representing 70 percent of plantings. No Chardonnay was available then. Skin contact during processing meant that virtually all Champagnes had a pinkish hue until technological advances in winemaking equipment would made it possible to consistently produce white Champagne in the 19th century. Not all Champagne producers celebrated the quality of pink sparkling wine. For instance, Madame Lily Bollinger dismissed it as the wine of the bordello. The global success of the style, however, saw Bollinger put a non-vintage rosé Champagne into production 16 years ago. Cellar master Demarville explains that Veuve Clicquot typically uses 12 percent of red wine to produce its non-vintage rosé Champagne. The base wine is similar to the classic Yellow Label Brut, with a portion of Pinot Noir. Outlining the painstaking approach to blending that defines the house style, Demarville said the traditional Yellow Label Brut blend comes from 50 to 60 different cru vineyards and includes reserve wines. After blending, the wine is bottled, undergoes secondary fermentation to produce bubbles and is cellared for three years. 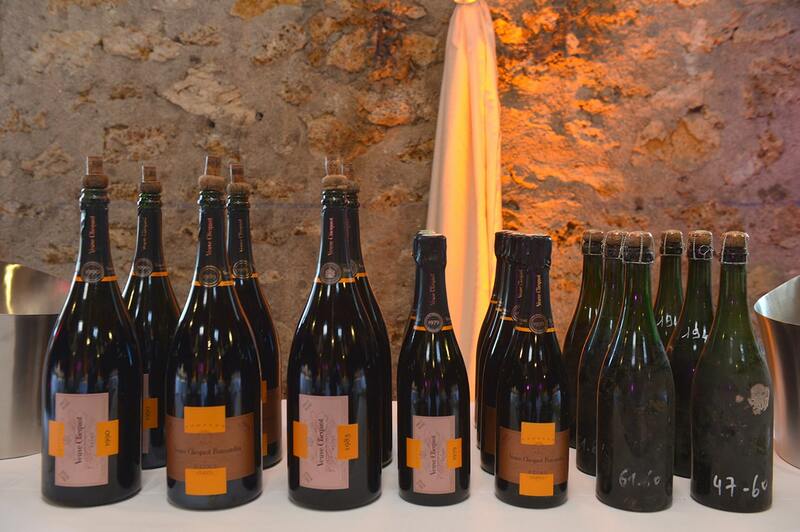 Much of the 200th anniversary media event focused on the quality improvements to the red winemaking at Veuve Clicquot. The winemaking team is increasingly taking a Burgundian approach to its Pinot Noir production, with 30 hectares of its 350ha estate vineyard earmarked for the production of still red wines. The majority of Veuve Clicquot’s vineyards are classifed as Grand Cru and Premier Cru sites, which denotes the consistent quality potential of the sites. Veuve Clicquot’s vineyards were certified for sustainability in 2014 and Demarville, who implemented a zero-herbicide policy, stresses the team is trying to do more. They are looking to change their farming practices without changing the wine, he explained. International visitors were transported to the Clos Colin, visiting a plot of 26 year-old Pinot Noir that consistently produces Clicquot’s best reds. Pointing to the grass cover between rows, he said it competes with the vines for nutrients, which helps naturally lower yields, and soaks up excess rainwater, which prevents sudden growth spurts. Clos Colin produces wines with dark colour and rich structure used to make the brand’s best still reds, which are aged in Burgundy barrels and used for the flagship rosé vintage cuvée, La Grand Dame. A small portion are also bottled as red wines to serve at functions at the Hotel du Marc in Reims. In honour of the milestone 200th anniversary of the quality advance of Rosé Champagne, Demarville explained Veuve Clicquot’s non-vintage style was being bottled for the first time in Jeroboams, a large format, three-litre bottle equivalent to four conventional bottles. He also explained how the complicated 2017 growing season means there’ll be no Vintage or La Grande Dame quality wines produced in either white or rosé. Samples of the recently blended base wine, the majority of 2017 vintage with reserve wines, for a future edition of the Yellow Label Brut showed freshness and purity, the classic quality that Veuve Clicquot aspires to, even in what was widely being reported as a “disastrous” vintage. Demarville said the base wine for non-vintage Yellow Label is blended each February, a process that takes weeks and carries over multiple tastings. In March, the team turns its attention to blending the non-vintage rosé and carry forward Madame Clicquot’s legacy.